Synopsis: In a city run by crime, St. Catherine's church and its benevolent caretaker, Monsignor O'Byrron, stand as the last bastion of good. 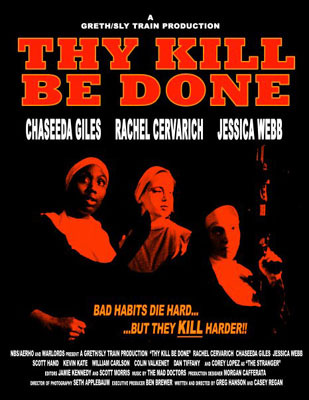 But when drug lord 'Scratch' Lucius and his gang of bloodthirsty delinquents murder O'Byrron on the church grounds, Sister Yvonne, Sister Morgan, and Sister St. Claire vow to take their revenge. But these are no ordinary nuns...This hard-hitting habit will stop at nothing until justice is served and Scratch and his gang atone for their sins - in the name of God or face-to-face.